Somehow all at once, spring happened in Chicago. The sneaky buds have covered barren branches with specks of green and bold stalks of yellow forsythia have burst from seemingly nowhere. All of this triggers my appetite to crave green. Bright, grassy, sweet green. A feast of fresh. In what form can I get the most of these treasures? A grain salad is the perfect dumping ground for all that calls me. And naturally, carbs always make things good. 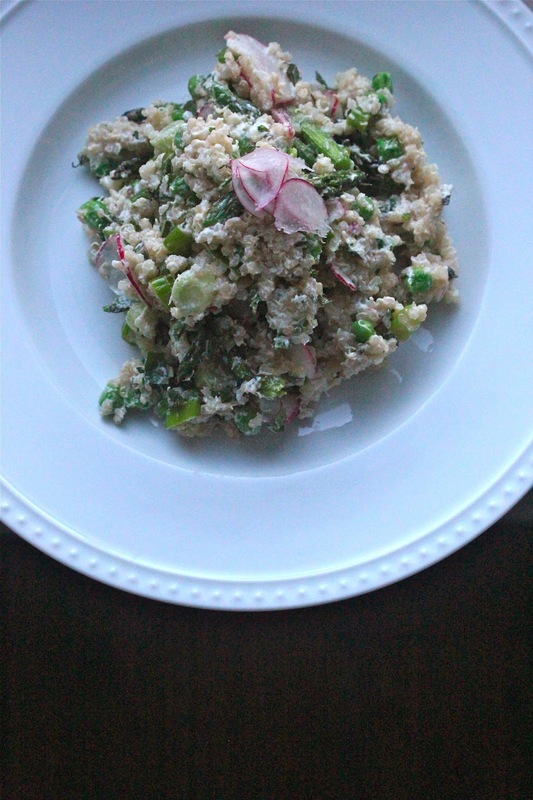 I’ve packed this quinoa salad with none other than the all stars of spring – asparagus, peas, mint, green onions, goat cheese and radishes. A word on asparagus cooking… I strongly advise grilling them. I prefer them cooked this way always, but it’s especially important for this salad, with its delicate flavors. A bit of char lends just enough depth. 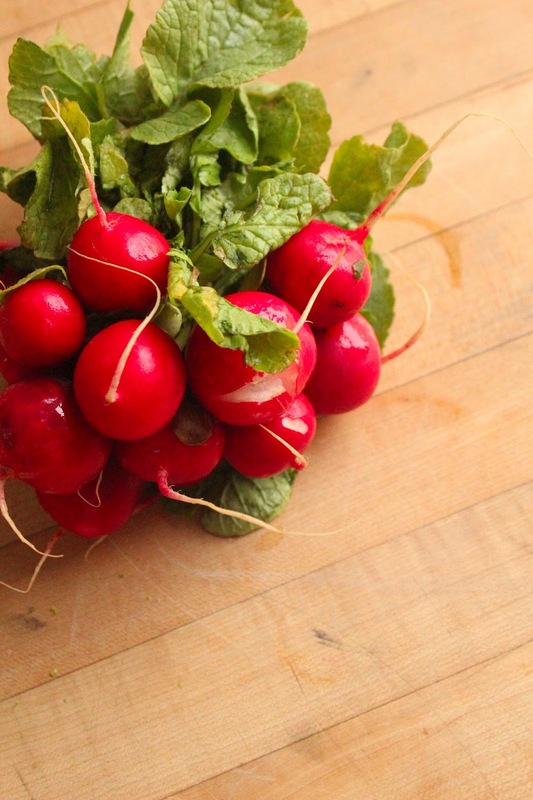 For easy slicing, just run the radishes across the slicing blad of a cheese grater. Takes 30 seconds for ultra-thin pieces, just watch your fingers! Preheat grill. Toss asparagus with 1 tablespoon olive oil. Grill over medium direct heat until just tender, about 3-5 minutes. Remove from heat and chop into 1-inch pieces. Combine quinoa and water and bring to a boil. Reduce heat to low and simmer for 10-12 minutes until quinoa absorbs all of the liquid. 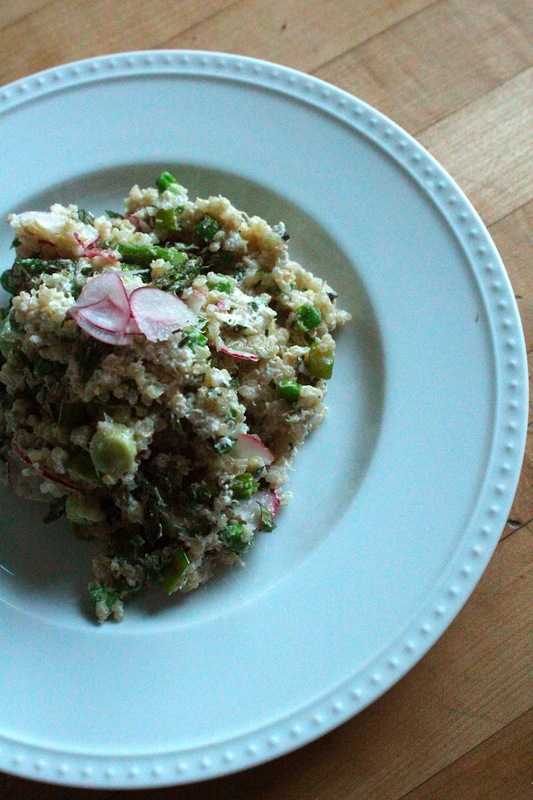 Remove cooked quinoa from heat and fluff with a fork. Whisk together remaining 2 tablespoons olive oil with vinegar and salt. Allow quinoa to cool for a few minutes until just slightly warm. Toss together with onions, mint, chopped asparagus, radish, goat cheese and olive oil mixture. Serve immediately.